Is your online booking system not meeting your expectations? Are you looking for travel portal development services or want to build your own travel portal software from scratch? If yes, then, you are in the right place. Why a travel portal? You may ask. Well, you should not just flow with the current rather strive against it and win the race. So, what is better than having your own system where you can interact, engage, communicate, and entice your customers? Outsource2india is a pioneer travel portal development company, where we provide you with all the services related to travel portal development. At O2I, we cater to the niche needs of travel management companies, destination management organizations, travel agencies, operators, aggregators, suppliers, home-based travel enthusiasts, etc. Do you belong to any of these groups? Then, by all means, you should outsource travel portal development to us to reorganize your internal processes and boost the workflow. O2I is the best travel portal development company in India that has been offering travel portal development services to the aficionados of the travel industry. When you collaborate with us for your service requirements, we can help you with all your travel portal requirements, including, development and designing of the travel website, Web & API integration, coupon management, payment gateway, XML binding, and white label solutions. Through travel software, you can attract your customers to reserve and book tickets through your application. So, a neat, high-performing and aesthetically appealing software is a must to have. At O2I, we can develop a comprehensive travel software - tailor-made to your need that can help you gain visitors in no time. We specialize in developing travel software for flights, bus, cars, hotels, transfers, sightseeing, holiday packages, and insurance. Outsource2india is a leading mobile app developer and with us, you can own your own mobile application to build custom features like - video guide, nearest sightseeing areas, restaurant finders, etc. for your travel application. 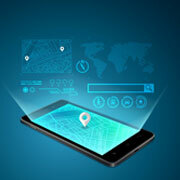 We excel in Android, iOS, and Windows mobile apps, migration services of your mobile apps. Our travel mobile application can cater to each demand of yours and upon using it, your customers will have an amazing experience. Like any IT solutions provider, we provide travel portal maintenance and support as well. We are an expert in software development and work 24 hours. And if you face any issues with the structure or the functionality of your travel portal, you can give a quick call to our contact center representative. They will cater to your queries instantly. We will also conduct regular audits to evaluate the performance of your software or app, and we are thoroughly diligent in our workflow and follow all the mandatory regulations necessary for data security management. O2I is a leading travel portal development company, where we inculcate best practices & procedures to develop and maintain your travel portal. One such approach is providing cloud-hosted solutions. Whether you need a web-API integration or migration services to the cloud, or deploying your data to the cloud, we can do all. Each travel portal development project is unique to us, and our experts work together to deliver a seamless, elegant, aesthetically appealing, highly functional, and cloud supportive travel portal. We provide MIS reporting services to enable you to make real-time and data backed decisions. With MIS reports, you can successfully evaluate the economic and health parameters of your travel business. We will start by analyzing your travel business and understand your requirements. Our MIS reporting services can help you find the bottlenecks and establish benchmarks to eliminate those. With effective reports at your disposal, you can check the variance with respect to the travel industry standards and can effectively monitor your business workflows. Thus, outsourcing travel portal development to O2I can give you the much-needed boost to expedite your business and eliminate waste. We are a leading travel portal development company in India and when you choose us for your travel website development, you can rest assured that we will be sticking to the best strategies of your travel portal development. Why Choose O2I for Travel Portal Development Services? At O2I, our team of travel portal development professionals has access to the state-of-the-art infrastructure in the form of world-class office spaces, uninterrupted network equipment, and modern communication tools and technologies. We can efficiently render our services for all your travel software development needs with our relevant industry experience in the travel portal development. Outsource2india has a global footprint with five different delivery centers and four global offices. This allows us to effectively cater to your requirements from different corners of the world and in various languages. We are an ISO/IEC 27001:2013 Information Security Management System (ISMS) certified organization and you can rest assured that all your data is completely safe with us. We Have several data security policies in place which ensure that your data is handled only by authorized personnel. Outsource2india is one such provider of travel portal development in India who has worked with a wide spectrum of the travel industry. When you entrust the travel portal development to us, we will ensure the delivery of a high-performing website and app that will boost your business outcome. We are an ISO-certified company and have a multi-level quality assurance process. The QA and testing are all done by our experienced team of testers who ensure that we deliver only the best travel portal development services. When you decide on outsourcing travel portal development to O2I, we will quote-price our software development services that means you will get a tailored solution according to your requirements. Our call center executives work day in and day out across all the time zones to cater to your requirements and inquiries. They are reachable 24*7 and when you partner up with us, you can be certain that our contact center executive will always be accessible for your calls irrespective of the time zone difference. At O2I, we have the essential resource competence, both in terms of expertise and wherewithal. You can hang on us for any spike in your business demands to exploit the cost advantages. The client was looking for a software development partner who could develop a multi-functional travel app which would integrate all types of hotels, sightseeing services, etc. Outsource2india has been a pioneer in providing Travel Portal Development services and a series of other tailor-made software development services to its global clientele. At O2I, we have an extensive suite of travel portal development experts who can provide you with a high-level of scalability & flexibility, which can be customized based on your requirements. We have in-depth knowledge and understanding of the travel portal development. We have rendered our services to the exact requirements of several global companies. We continually grow and streamline our travel portal development services to deliver immeasurable value to our clients. We also offer other similar services such as Healthcare Software Development, Banking & Financial Software Development, Desktop application development, and more. Get in touch with us today for a reliable, high-performing, efficient, and cost-effective travel portal development services.